The BI issued its one-page order on Fox on Monday, April 23. Fox was directed to leave the Philippines within 30 days from receipt of the order. “She was found to have engaged in activities that are not allowed under the terms and conditions of her visa,” BI Commissioner Jaime Morente said on Wednesday, April 25. Mangrobang also noted that the deportation case against Fox is still pending as she has yet to submit her counter-affidavit on the case. “It is only after the parties have been heard, will the case be submitted to the Board of Commissioners for their deliberation on whether or not she will be deported and barred from entering the country in the future,” Mangrobang said. Fox, who has been living in the Philippines for 27 years as a missionary and as an advocate of farmers’ rights, was arrested by BI officers on April 16, for engaging in “illegal political activities” in the country. She was released on April 17 after validating her missionary visa. In a statement, Fox said she was surprised when she heard the news about the BI’s order directing her to leave the country after her missionary visa was forfeited. “I was surprised, as I had thought the process was that I would have 10 days to put in a counter-affidavit to answer the charges. It was through the media that I heard of the decision, as I, or my legal counsel, don’t yet have a copy. I am very sad that the decision at present is that I leave the Philippines,” Fox said. In a television interview, Jobert Pahilga, Fox’s lawyer, slammed the BI’s directive, claiming it violated the nun’s right to due process. “What we received yesterday was the supplemental report of the intelligence division. We were given 10 days to supposedly file our counter affidavit. That’s why we were surprised there was an order by the BI to forfeit her visa,” Pahilga told ANC. Pahilga said their camp will file a motion for reconsideration. He also insisted that Fox has only engaged in missionary work and not in political activities during her stay in the Philippines. Mangaronbang, however, clarified that forfeiting Fox’s visa and her possible deportation were different cases. “The issuance and grant of a visa is a privilege, not a right, hence a hearing is not necessary in visa forfeiture proceedings,” Mangrobang said, noting that it is the bureau’s discretion whether or not it would cancel a foreigner’s visa. 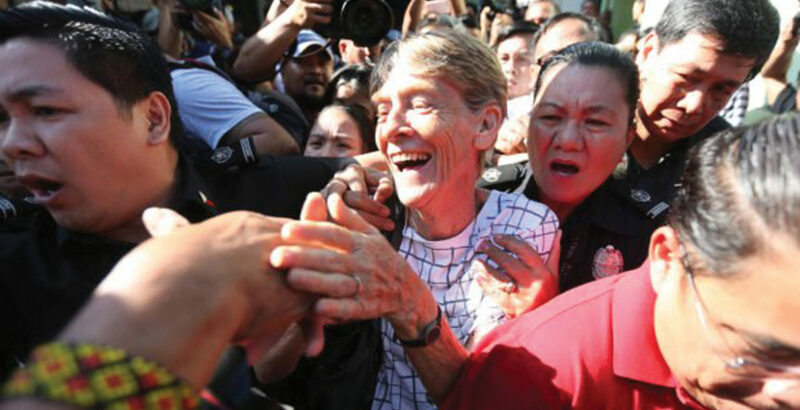 Meanwhile, Senate President Aquilino “Koko” Pimentel III agreed that the BI has the power to order the Australian nun to leave the country.